In many regards, Crystal Wang is a typical 13-year-old girl. She watches music videos and variety shows on YouTube and draws in her free time. “The Hunger Games” movies are among her favorites. She likes to read and wants to be a doctor when she grows up. When you look beyond the straight-A student’s sweet, soft-spoken exterior, however, a fierce competitor emerges. Indeed, as a seventh-grader, Wang is one of the United States’ rising table tennis stars. Going into this weekend’s national team trials for the world championships and Pan Am Games, she’s a top contender with her sights set on the 2016 Olympics. Born in Arizona and now living in Boyds, Maryland, Wang has spent many summers in China with her grandparents. It was there she was introduced to the game of table tennis. Back in 2007, in a country that regularly churns out the best players in the world, the 5-year-old American made an impression at a local Chinese community center. Crystal Wang is hoping to make the United States Olympic team in 2016. Needless to say, she doesn’t play the piano much anymore. Every day after school, Wang practices at the Maryland Table Tennis Center (MDTTC), and the club has turned into a second home of sorts. It’s where she finishes her homework, practices and often eats dinner with her dad. It’s hard to imagine a better place for a blossoming player like Wang. With a long history of great players both training and coaching there, the facility is steeped in Chinese and American talent. Wang’s coach, Jack Huang, was himself part of the Chinese national team from 1976 to 1983 and the No. 1 player in the U.S. in 1990. While a lot of women players have fast hands, the 5-foot-6 Wang is actually taller than many, allowing her to leverage shots and deliver the ball with greater force and power. Capitalizing on her height, she uses her shoulders and waist to literally whip the ball across the table at her opponent in a barrage of targeted shots. Her quick feet and coordination come in handy for not just working the table itself, but also the 40-foot-long, 20-foot-wide court. O’Neill speculates that Wang’s age has actually been an asset when it comes to the competitive mindset necessary for a high-level table tennis player. “I think the young age helps because she’s not aware of what she’s doing — she just comes out of the box putting pressure on from the very beginning,” he said. She has this great intensity, focus and calmness — a certain poise about the way she plays. 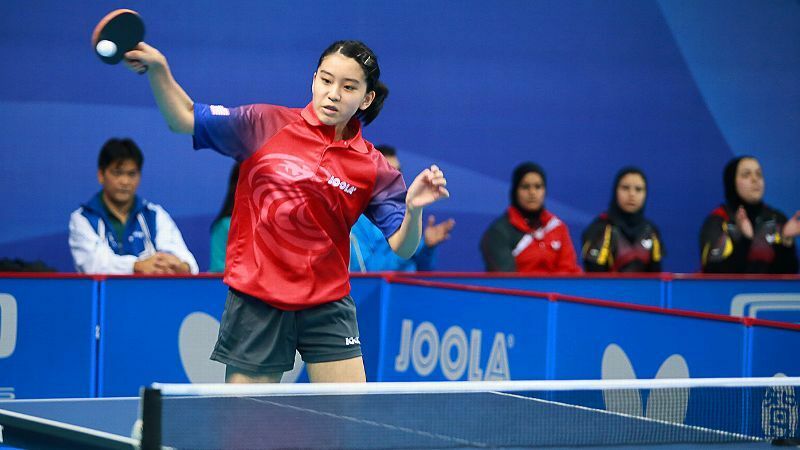 Wang scored her first big title when she was 11, becoming the youngest player to win the 21-and-under crown at the 2013 USA National Table Tennis Championships. This past December, she managed to do it again at age 12, which gave her the distinction of also being the second youngest to hold that title. At those same championships, she became the youngest player to make it to the women’s singles final, where she ended up in second place, in addition to taking home the bronze medal in women’s doubles. Wang has also picked up hardware at a laundry list of international competitions, including world championships. Going into this weekend’s competition, Wang realizes she’ll be up against some of the best women’s players the U.S. has ever seen. But it doesn’t seem to make much of a difference. “I feel nervous, but I still have a lot of confidence in myself,” she said. “I want to achieve more and get better and make the Olympic team.